If you purchased a license for version 7.x or 5.x, then you get version 7.4 free of charge. You can use the same license details. By default, the "32+64-Bit Edition" will now be recommended on systems with the 32-bits edition of Excel 2010 and later. The "32+64-Bit Edition" is the universal version of our add-in (xlam file) that works with both the 32- and 64-bits editions of Excel 2010 and later. In this edition, many tools run up to 3 times faster compared to earlier 7.x versions. Instructs Setup to install the universal 32+64-Bit Edition (xlam files only). This edition works with Excel 2010 and later both 32-bit and 64-bit editions. Instructs Setup to install the 32-Bit Edition (xlam file and COM add-in/dll file). This edition works with the 32-bits editions of Excel 2000 and later. Fix for a strange empty Excel window that could sometimes show when opening Excel by double-clicking on an Excel-file after a recent Windows/Office update in combination with ASAP Utilities. Upon request, six new options are added. You can now select cells based on multiple values at once. These values can be in a range of cells in your workbook. 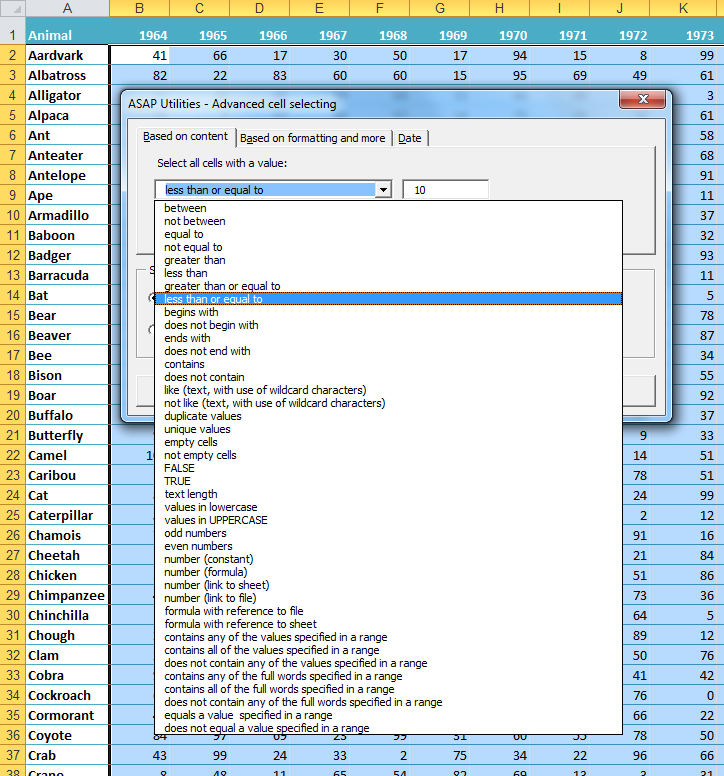 You can use this for example to select negative keywords in a large dataset. searching for "test" selects cells with values such as "This is a test" or "Testing now"
searching for "test" selects cells without the text "test" in it. searching for "test" selects cells with values such as "This is a test" or "Ready (test)"
searching for "test" does NOT select cells with a value such as "We're testing this"
searching for "test" does NOT selects cells with values such as "This is a test" or "Ready (test)"
searching for "test" does select cells with a value such as "We're testing this"
searching for "test" selects cells with the value "test" only. searching for "test" does NOT select cells with a value such as "test 123"
searching for "test" does NOT selects cells with the value "test" only. searching for "test" selects any cell that has not the same exact content, such as "test 123"
Changes in the "32+64-Bit Edition"
Speed improvements. Many tools now run up to 300%(!) faster compared to earlier 7.x versions. Didn't sum the values in version 7.4 if a color index number was given. This is now fixed. After a recent Windows/Office update the PDF export was no longer available as on of the export formats. With this ASAP Utilities update it is back again. When you used the Preview pane in Windows File Explorer, in some situations Excel showed a "Run-tim error '50290': Method 'Saved' of object '_Workbook' failed" error. We've created a workaround/fix for that. 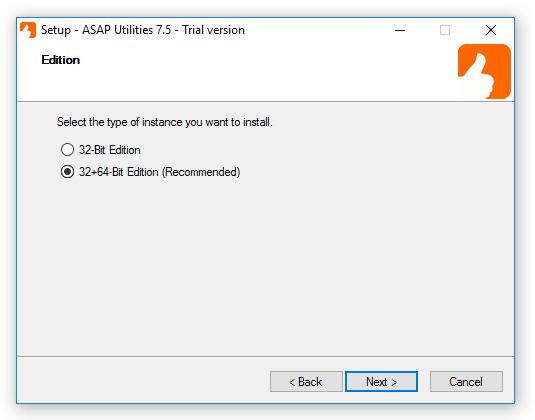 The filename of ASAP Utilities has been changed from "ASAP Utilities x64.xlam" to "ASAP Utilities.xlam" to reflect better that this file is not only for the 64-bit edition of Excel but for both the 32- and 64-bit editions of Excel 2010 and later. Changes in the "32-bit edition"
In November 2017, we were contacted by about ten users that suddenly ran into an issue with their ASAP Utilities in combination with Excel 2016 32-bit. That seemed to be caused by a Microsoft update. Unfortunately we haven't been able to reproduce this on any of our test or production systems so far, but in corporation with these users we've found a workaround for it. In case you get the following error, then please install the preview edition of ASAP Utilities 7.5 or choose to install the "32-bit + 64-bit edition" of version 7.4. "Sorry, something went wrong in the ASAP Utilities.xla auto_open() event, build menu. -2147417848: Method 'ASAP_Utilities_MenuBuilder' of object '_CPublic' failed on line 670"